The temple in located in Qena the capital of the province inhabited by Coptic and Muslims, pop 2,000,000. This town is very famous for manufacture of water pots, called in Arabic “gula” jars. The modern town of Qena was founded by the holy Muslim Shiek Abdel Raheeem El Kenawi who spent all of his life in this town and died in 1170 AD. The birthday of this saint is celebrated every year, and a great number of pilgrims come from all over Egypt for this celebration. The name of the city goes back to the time of the pharaohs , it was taken from the ancient Egyptian word Qeny, which means to bend. this name was chosen for the city because the Nile river is taking a curve shape in this spot. The temple of Hathor at Dendera was built in the 1st c BC and It is one of the best preserved temples in all of Egypt. It was built by Ptolemy 8th and Queen Cleopatra 2nd and then later Roman Emperors continued to decorate it and honour of the goddess Hathor, the goddess of love, music and maternity. The goddess Hathor was identified by the Greeks with Aphrodite. When visitors pass through the first gateway, built by Roman Emperor Domitian at 80AD. This gate leads to the main building of the temple. 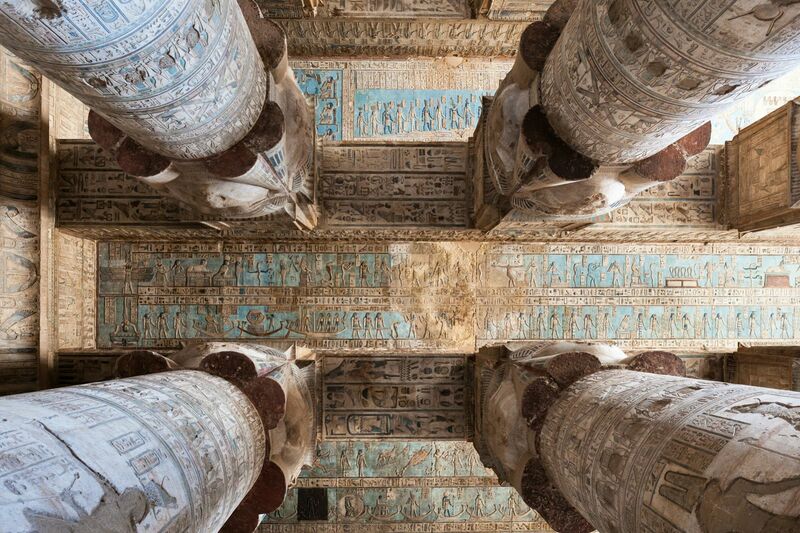 The great hall of the temple is decorated with Hathoric columns, columns with the face of Hathor. This is found is very good state of preservation. The front upper edge of the cornice is decorated with the winged sun disc. The front portion is enclosed by stone screens between the columns and the scene which represent the Roman Emperor Tiberius and other rulers who present votive offerings to the goddess of the temple. Hathor is chiefly represented with the horns of the sacred cow protruding from her head, supporting the solar disc of the sun, and in her hands holding the symbol of life and sceptre. Sometimes she is represented with the head of a cow. The interior walls of the great Hall represent remarkable scenes that mainly depict sacrifices being made to the goddess of the temple. The amazing ceiling with astronomical representations is also very interesting. The ceiling is divided into 7 divisions. The first division on the eastern side depicts goddess Nut, goddess of the sky, bending herself towards the earth and the sun disc is seen shining on the temple and the mask of Hathor. Next to this is a representation of the sun boat and star goddess. Next to this the western ceiling shows a divine in a perfect representation of the zodiac signs, which makes this temple one of the most famous temples. The original zodiac is in the louver museum. The 12 figures of the ram, the bull, the heavenly twins, the crab, the lion, Virgo, the scales, the scorpion, the archer, the goat, the watering pots and fishes with glittering tails. On the inner walls of the screen the hawk headed god hours and the ibis headed god Thoth are pouring drops of holy water over the king. This scene is called the baptism scene, symbolizing life and happiness. The second hall was 6 columns adorned with rich capitals and granite pedestals. On both sides of this hall are small rooms which were used as store rooms to store the wine jars that came from Crete island and the fertile oasis of Fayioum and Kharga oasis. Next is the central chapel which has two altars, one for the sacred boat and the other one for the sacrifices offered to goddess Hathor. 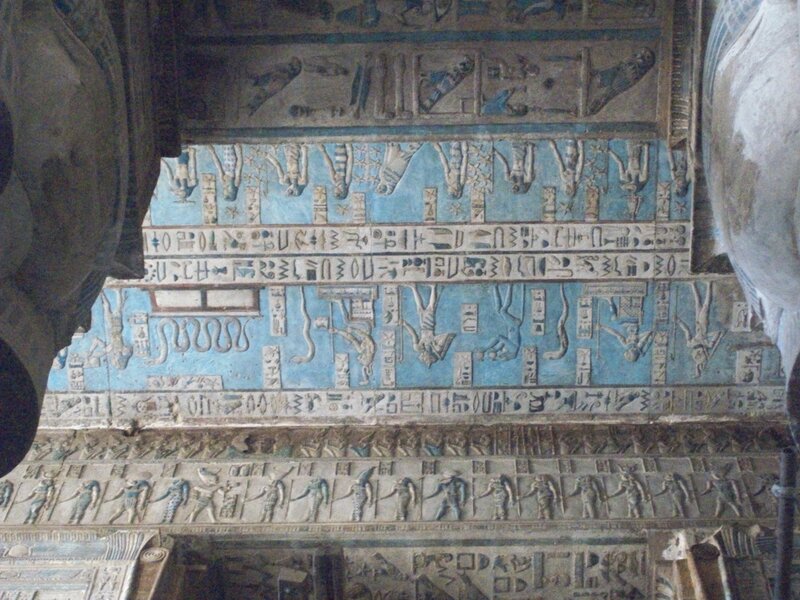 The beautifully sculptured reliefs on the walls of the shrines represent Ptolemy 8th and other rules whose names were left blank in the oval cartouches, dancing with offerings to the sacred boat of Hathor and her husband Horus. The king’s representatives, the high priests, noblemen used to gather in the great hall in attendance for the daily rituals. The ceilings are covered in stars and black smog from the fires of the later inhabitants of the temple. The rooms around the sanctuary were used for scientific purposes, the storing of the sacred boat, the sacred reath, the golden image of goddess Hathor, musical instruments. You have to note the small corridor on your right will take you to a small room which contains the crypt, which is highly recommended. The staircases which lead to the roof of the temple are decorated with some beautiful symbols representing the 12 months of the year. ON the east corner of this roof lies the chapel of God Osiris. The scenes on the walls represent Osiris’s rising from the dead and becoming the god of the underworld. It is from this chapel that the best representation of the zodiac was taken. Southern exterior wall relief show Cleopatra 7th and her son Caesarian, son of Julius Caesar, making offering to Hathor and all the deities of Dendera. On the same wall near the cornice are some stone lion heads, to serve as water spouts. Adjoining the temple building to the west is the sacred lake. This lake was used for the priests’ ablutions. Next to the lake is a small shaft, discovered in 1917, which contained valuable treasures of Cleopatra’s era, which are now displayed in the Egyptian Museum. If you look around the temple you will notice the remnants of the mud brick wall which surrounded the whole temple, and remains of Coptic houses and churches, including large number of Coptic crosses chiseled on the stones. To the north lies the Mamisi, the birth house of Horus, surrounded by one row of columns, with different capitals embellished with relief images of god Bes a hideous dwarf, with a big stomach and long whiskers. He is the chief god of childhood who drove evil spirits away from the babies. This little temple was erected by the roman Emperor Trajan in 90 AD dedicated to the divine god Horus, son of Isis and Osiris.